A Sales Agreement, similar to a Bill of Sale, is used to document a transaction of greater than $500 between a buyer and a seller. The Sales agreement can be used for anything, including assets, vehicles, and equipment. It details important information such as the time and place of the purchase, purchase price, method of payment, shipment and delivery arrangments, and more. A Sales Agreement CANNOT be used to buy or sell real estate. What is the purchase price (e.g. 570.00)? Will the Buyer(s) be putting a down payment on the goods? How much will the down payment be (e.g. 100.00)? Will the Buyer(s) need the goods shipped? Where will the goods be shipped to? Where will the Buyer(s) pick up the goods? The goods are being sold 'as-is' by the Seller(s). Can this agreement be assigned to another party? We highly recommend that your Sales Agreement be signed in front of a Notary Public and one or more witnesses. We strongly recommend obtaining an attorney reviewed Sales Agreement directly from us. Below are some random samples we have created with Documatica. Please note that these documents reflect a certain set of answers, and it is very likely that the document you require is different. 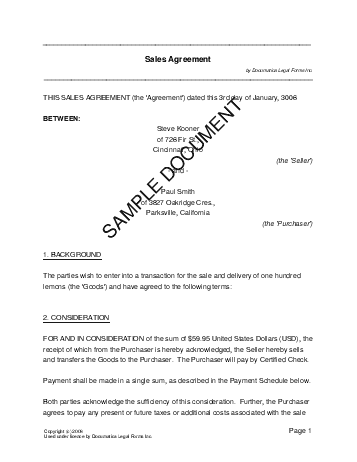 Do not rely on the templates below - create your own customized Sales Agreement with our webpage. For maximum legal protection, obtain a lawyer reviewed Sales Agreement directly from us.